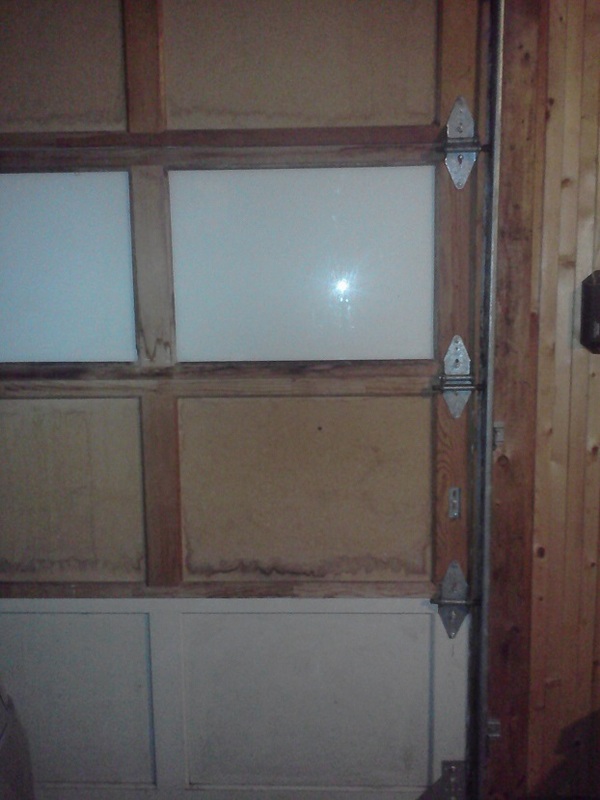 Here’s an earth-friendly and budget-lite solution for having trendy coach house garage doors for less than $50. I cheated. This is a project I did last spring (not this week). My quest to paint something every day for a week was interrupted by life, visitors, children, a beautiful early evening walk, and running out of daylight. But I cheated even more when I did this project, and I’ll tell you how. It took less than an afternoon. 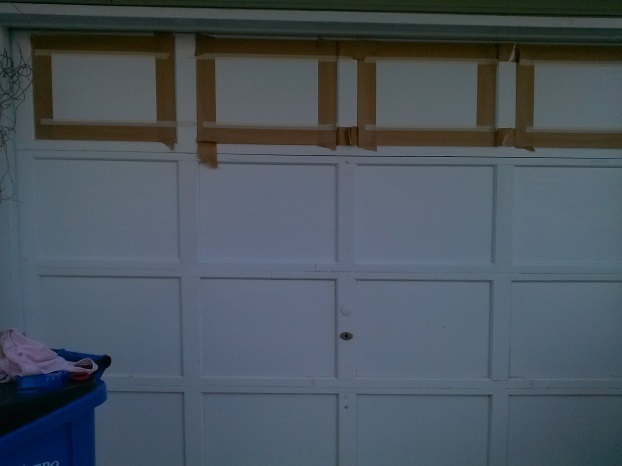 We used supplies we already had on hand and two coach garage door hardware kits that cost about $20 each. The windows were glazed over with…wait for it…leftover spray flocking (Fake Snow) from Christmas. 18 Months Later and still going strong! But they’re the SAME doors! 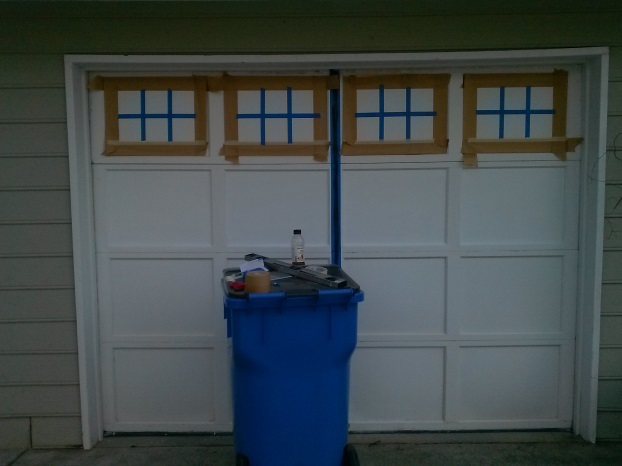 You could always pay $100 for simulated garage door windows (which also need to be painted) or approximately $35 for window stickers but with paint, this project is probably within your reach, today. I taped off the outer edges with wide painter’s tape (I don’t recommend this tape because it doesn’t stick well, it’s just what I had on hand). 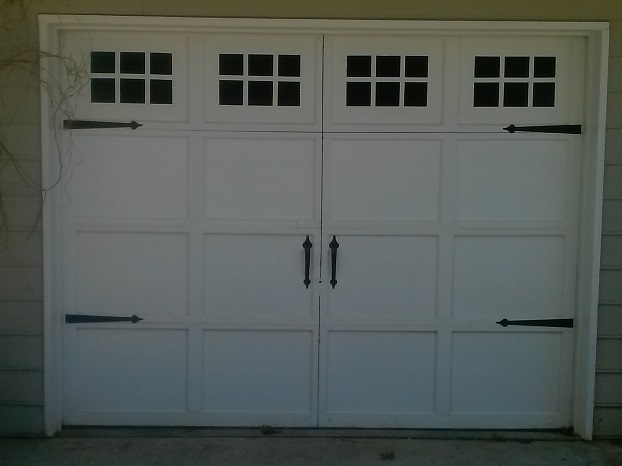 The purpose of this is to create a good edge and protect the surrounding white paint. I used blue painter’s tape to create a grid within each frame, and an empty CD case to help keep my grid lines even. This is probably easier with a level and a ruler but I wasn’t sure how much space I needed and this worked, so I went with it. 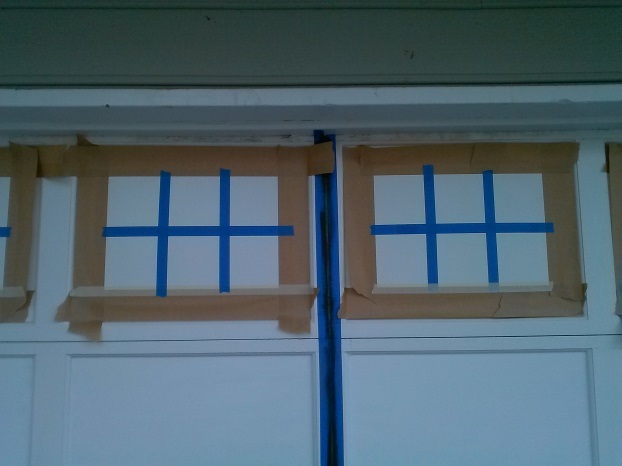 I also used my painter’s tape to create a space to paint a black line down the center of each door. My line wasn’t wide enough after a pulled off the tape (I was nervous about creating too thick of a line the first time) so I came back again with more tape (this time torn to make it go further) and broadened the line. From a distance, this gives the illusion of a crack between two doors (that is, in reality, just one solid door). 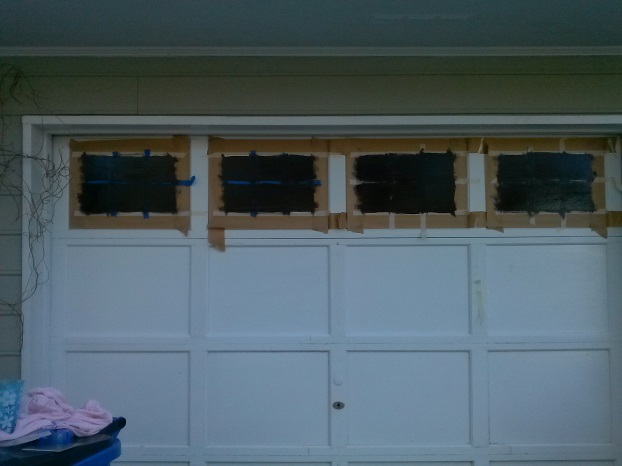 And then I used glossy black paint (to create the look of window glass) to fill in the grid. 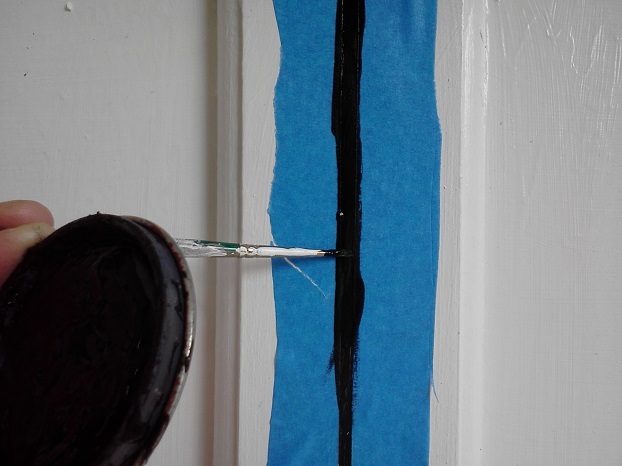 This step went quickly as I brushed right over the painter’s tape and removed the tape when the paint was dry to the touch but still had some pliability to it. I also went back over this with a second coat. 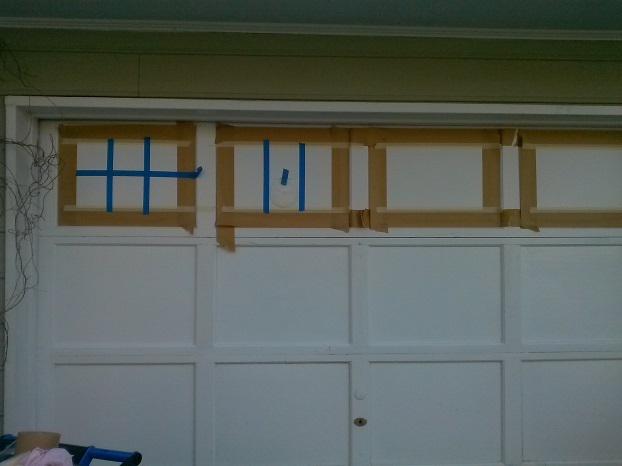 The effect was immediate when I removed the tape (and there were place that needed touch up). The transformation with paint accents alone (with the old hardware removed and prior to my husband installing the new hardware). The illusion is obvious from the inside (as is the age and wear and tear on these doors that are original to when the house was built nearly three decades ago). The end result (still needing a little touch up of the center line from where I removed additional hardware). It is difficult to tell that the second row of panels from the top is glass, unless you tap on it. This is an easy Saturday afternoon project that provides a lot of bang for the buck. 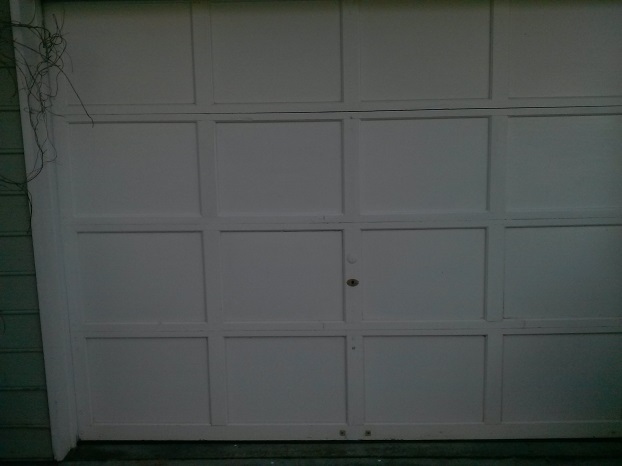 Just a couple of weeks ago we met a neighbor while out walking who said they always make a point of looking at our garage doors when they drive by. It was so fun to see the utter disbelief when we explained that the doors were Trompe-l’œil. 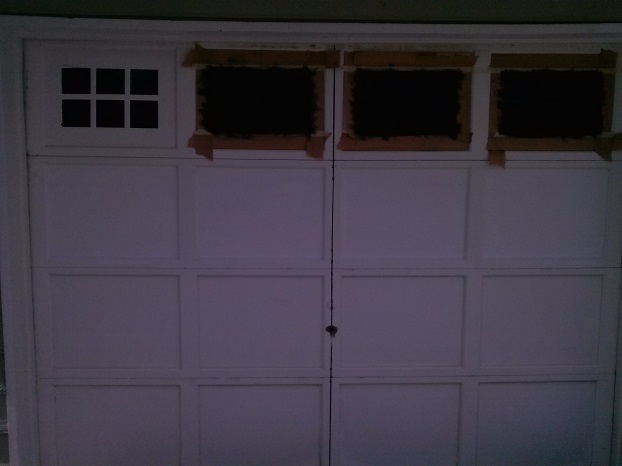 Since completing this project, I’ve gone back and puttied, sanded and painted the holes were the previous hardware was. We didn’t do this initially because we were unsure of whether any of this was a good idea and whether we would want to resort to the original look/original hardware at some point. We love our doors and haven’t looked back since. 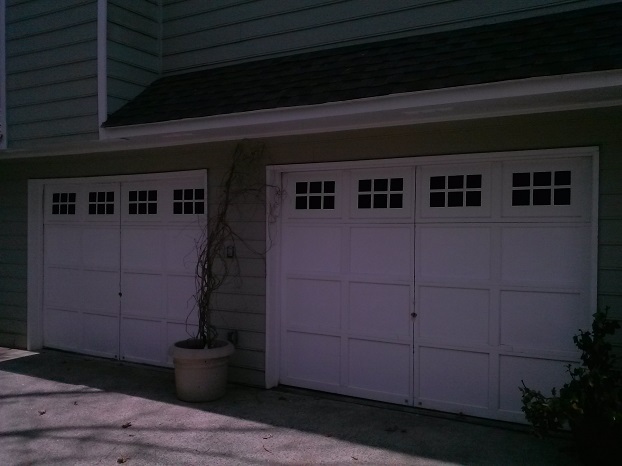 Do you have garage doors to “update”? Comment if you try this! Would love to hear and see how it goes! This is project 4 of 5 of “A Fall Weather Project a Day (and a blog post) for a Week.” Read about Project 1 here and Project 2 here and Projects 3a and 3b here and here. 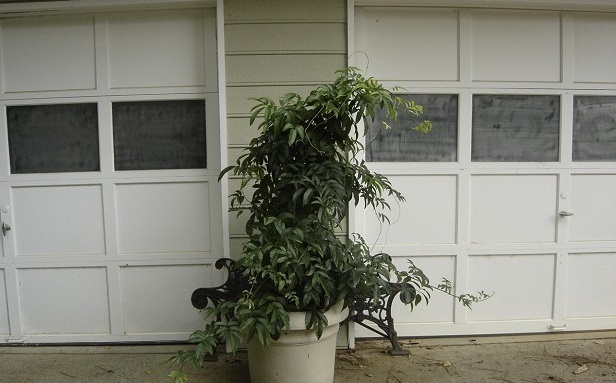 Wow what a cool way to add some elegance to your garage door. The addition of handles gives the door a sort old-fashioned look.they created a visual interest. thanks for sharing I’m happy to see this.